The distractions in our lives are overwhelming. We are constantly attempting to keep up with the whole world and our own lives, which often leads to us feeling like failures. It is IMPOSSIBLE to stay connected IRL (in real life) when we are connected online 24/7. We have phones, tablets, computers, gaming systems, all loaded down with apps to keep us from having to interact with an actual person. 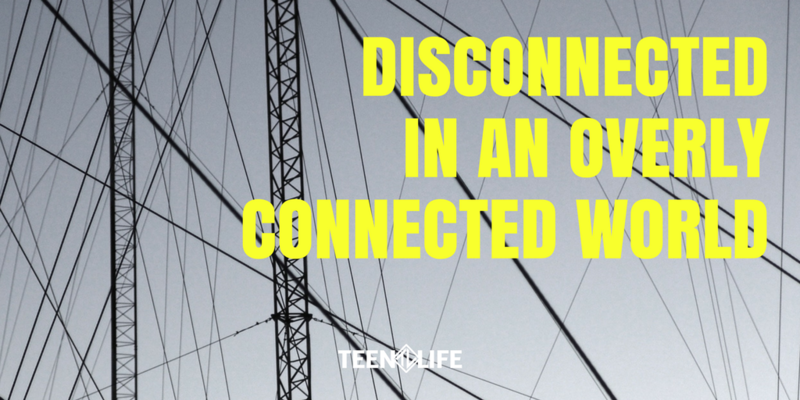 The lack of connections we feel IRL often leads to feelings of depression, anxiety, and loneliness. Social Media lies to us. Constantly. Friends post pictures of achievements. Photoshopped Instagrams make us feel ugly. Snapchats of being happy with a significant other can make us feel lonely. Picture perfect families and homes that are posted make us feel lesser than. Teens and adults alike fall into the trap of the lies that we all share online. Teens are constantly racing to stay popular online with the most likes, re-Tweets, shares, followers, and it is IMPOSSIBLE to keep up with the ever-changing status quo of the online world. Attempting to keep up with social media lies can make teens feel depressed or withdrawn from the people who support them. Information overload. Having a constant stream of information easily accessed from literally the entire world is unhealthy and is often depressing. I personally have quit following news on my social media accounts because it would ruin my day constantly seeing the heart breaking stories of death, bombs, natural disasters, etc. Teens are not only dealing with their daily interactions, but the lies of social media, and the often negative news. Attempting to process information that is a) unnecessary to our everyday lives and b) may or may not be accurate information is overwhelming, which can lead to feelings of depression or anxiety. We all need to take a break from the negative overload of information forced fed to us on our social media accounts. Followers ≠ Friends. Researchers have found that there is a negative emotional connection between how many online friends we have versus our real life happiness. What does that mean? It means that when a person becomes more obsessed with how many friends they have online, the less happy they are in real life, especially for teens and young adults. This complete obsession with social media followers leads to real life relationships being lost by the wayside because teens lose the ability to communicate in real life. Not being able to communicate about emotions without emojis is a serious issue that should be addressed and is why educating teens on communication is a core tenet of Teen Life. I have found the best way to combat the depression, anxiety, and loneliness that comes from social media is to disconnect for at least one hour a day. This can be scary, especially for teens who are falling for the lies, being overloaded, and are concerned about followers. Disconnecting from all electronics and all social media for an hour a day can lead to us finding new ways of connecting in real life, recharging our brains to be better able of seeing through the lies, and can help improve our moods. If you want to hear more about this subject, check out this eight minute video that truly highlights what is going on when we have an obsession with our social media.